There are two types of meditation used to concentrate and develop the mind. SAMATHA or TRANQUILITY meditation trains the mind to concentrate on only one object. VIPASSANA or INSIGHT meditation trains the mind to observe the many objects coming into awareness through the six sense doors in order to develop the wisdom to eradicate the defilements in the mind and be freed from suffering. Three things must be present for awareness to arise – an object, the sense door and the mind. By contemplating on a single object repeatedly, (for example the breath or a visible object) the mind can be calmed and brought to one-pointedness. Similarly, many other methods of SAMATHA meditation can be found just by focusing the mind on any one object. There are 40 types of Samata meditation methods. (A more detailed explanation can be found in the VISUDDHI MAGGA). Contemplating the IN-AND-OUT BREATHING (ANAPANA SATI MEDITATION) is very popular as it is well-known by many people. It is, as well, easily cultivated. Breathing is a continuous body activity, even though you are not usually aware of it. But if you concentrate on the in-and-out breath, you can begin to be aware of it. Remain aware of the sensation of the breath as it passes in and out through the nostrils. Or, bring your awareness to the rising and falling movements of the abdomen. IF YOU CONTINUE TO FOCUS ON THE BREATH REPEATEDLY, THE MIND WILL START TO BECOME CONCENTRATED. THE MOST IMPORTANT THING IS NOT THE OBJECT ITSELF, BUT KEEPING THE MIND FIXED IN ONE-POINTEDNESS. Therefore, the training of the mind in this way is regarded as deserving thorough investigation. By looking continuously at a visible element such as a COLOUR, CLAY, WATER, FIRE, or the WIND shaking a leaf, the mind can also develop one-pointedness. This is known as KASINA MEDITATION. Fixation on a CORPSE or a SKELETON as an object, known as ASUBHA MEDITATION, is a good practice for a person who has a developed concentration. Someone who is irritable, depressed or worried would benefit from concentrating on thoughts of LOVING-KINDNESS by thinking repeatedly: “May all beings be happy”. This practice of METTA MEDITATION is also well-known to many people. Now you can begin to understand the principle of Samatha Meditation, which is to focus the mind on one object repeatedly. The object may be YOUR OWN BODY, an external object, or even a WHOLESOME THOUGHT. Numerous objects can also be found in nature. Hindu meditators have found many such various objects of Samatha Meditation. There are 40 traditional objects of Buddhist Samatha Meditation. The essence of the Buddha’s teaching is to develop the wisdom to be freed from suffering. NOTHING IS PERMANENT. Everything comes and goes. Yet when we lose something that we like, we feel sad. If, however, we can look at life with wisdom, we can see that things do not happen the way we want, but according to IMPERSONAL NATURAL LAWS. Realization of the IMPERMANENCE (ANICCA), UNSATISFACTORINESS (DUKKHA), and IMPERSONALITY (ANATTA) of all phenomena comes through observing each and every thing with wisdom. This is Vipassana (Insight) Meditation, also known as Panna (Wisdom) Meditation. Vipassana Meditation is a completely different practice than Samatha Meditation. While concentration is a basic necessity, the mind is not kept in one-pointed fixation on a single object, as in Samatha Meditation. ANYTHING THAT COMES TO ONE’S AWARENESS THROUGH ANY OF THE SIX SENSE DOORS CAN BE AN OBJECT FOR VIPASSANA MEDITATION. Being mindfully aware of the FOUR POSTURES (IRIYAPATHA) – SITTING, STANDING, WALKING, AND LYING DOWN – is an important part of Vipassana Meditation. When seated, be aware of sitting posture. While standing, be aware of standing. When walking and lying down, these also should be mindfully noticed. This may seem simple to practice and some may think that this is of no benefit, but when the mind remains constantly aware of these four postures, meditation progresses very well. IT IS ALSO IMPORTANT TO GO THROUGH ALL DAILY ACTIVITIES WITH AWARENESS (SATI SAMPAJANNA). Washing, eating, drinking, bathing, dressing, and etc should all be done with constant mindfulness. For example, while drinking a cup of tea at the table, be aware of STRETCHING THE ARM… TOUCHING THE CUP… LIFTING THE CUP TO YOUR LIPS… SLANTING THE CUP… DRINKING… DRINKING… RETURNING THE CUP TO THE TABLE… and finally, REMOVING YOUR HAND. 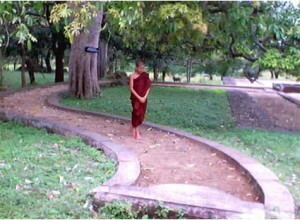 How to Develop INSIGHT KNOWLEDGE (vipassana gnana) by Practicing Walking Meditation. First note-standing ,standing and then note the thought wanting to go forward. Then knowingly moving forward the right leg and then the left, do the walking. Walk an appropriate distance(30 to 40 feet) noting-left, right-left, right. When you feel like stopping note that thought. Then stopping. stopping should be done mindfully. Then note turning, turning. Turn slowly. Continue left right concentrate on the walking. From the start of lifting the foot until you put it down, all action regarding walking should be done mindfully keeping the mind on the foot. During walking meditation make and effort to watch each and even step mindfully. If you are able, walking correctly note the walking in three stages of LIFTING,MOVING FORWARD and PLACING. Objects for insight.Concentrate and note heaviness and lightness on the foot.Those are fundamental objects for insight (vipassana). If you understand clearly in your own, It is call yathabhutha gnana. OBSERVE IMPERMANENCY (anichcha) of fundamental objects. Observe suffering(dukkha) of heaviness and lightness.and observe non persenal (anatta)action about heaviness and lightness. These three characteristics are most important facts to get INSIGHT.Developing the mind using these three concepts It is call vipassana Bawana (Insight meditation)It is the way to reach liberation or everlasting happiness (NIBBANA).